When considering your lodging accommodation options, what’s most important to you? Do you want a standard cookie cutter room that will be the same(ish) wherever you go? Or do you want to experience something new and unique each time you travel? If you’ve only ever stayed in hotels, why? If you’re a fan of Airbnb or independent bed and breakfast operations, what appeals to you about them? Or if you love to stay in cozy little B&Bs, what draws you to them? These are some good questions to ask yourself as you think through your itinerary each trip. There are some good reasons to stay at any of these three options, and a few downsides as well. 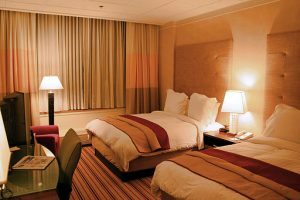 Hotels provide a consistent experience, they’re located close to major attractions or downtown business districts, and you can count on them being clean and maintained for you during your stay. You’re also rewarded with loyalty points and other benefits like upgrades for frequent stays. Of course, if you’re looking for an individual, unique experience, hotels won’t give that to you. They’re there for convenience and/or price. It’s a place to sleep, or to be pampered if you’re staying at a luxury vacation hotel, but you’re still just one of hundreds of guests. If you want to investigate a specific part of a city, live like the locals, have more room to relax, and cook some of your own meals, Airbnb offers many options. Typically, you have a more personal experience, possibly interacting with the owner of the property who may also live nearby. You’re often nestled in a residential neighborhood, and you can discover local finds that are off the beaten path from the heavily frequented tourist areas. You can also save money on your trip by eating in. In order to compete with chain hotels, Airbnb is now rewarding loyalty as well. 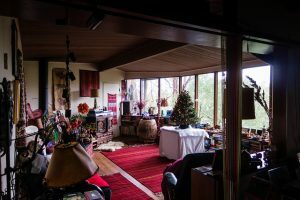 Long before Airbnb, independent bed and breakfasts provided a similar experience for travelers seeking something unique. When you book your stay at a bed and breakfast, you may have all the benefits of a hotel—clean, maintained rooms—but you also get the chance to interact with a smaller group of guests and the owner/operator, who may be cooking your meals and can provide expert knowledge about the area’s sites and history. In fact, if you love history, a B&B may be your best bet, as many of them are originally historic homes that have been converted into a place to visit and relax. But on the downside, it’s like staying in a small hotel. You may have your own bathroom or you may end up sharing one with other guests. If you need your privacy and space, be sure to check out the B&B’s website and room type before you commit. What’s your lodging preference when you travel? What makes it your favorite? What option do you like the least? Tell us about it in the comments below, on our Facebook page, or in our Twitter stream. Business travelers who have taken an Uber or Lyft instead of hailing a taxi, or stayed at an Airbnb property instead of staying at a hotel chain, you’re among a growing majority of employees whose companies are encouraging using the emerging sharing economies. According to a survey conducted by Chrome River Technologies, an expense and invoice management technology solutions company, 78 percent of companies with 1,000 or more employees allow their travelers to use ride-sharing services, while 68 percent allow home-sharing services. The company asked 100 chief financial officers, controllers, and treasurers at 100 U.S.-based companies for this data in order to determine how much freedom corporations provide their employees when they travel for business. 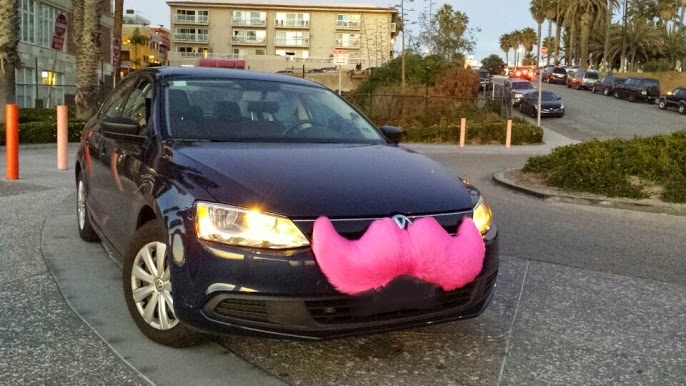 The instantly recognizable pink mustache of a Lyft car. “Corporate travel and expense policies should be agile enough to address the ever-changing nature of business travel. It’s refreshing to see that larger organizations have already incorporated sharing economy services into their policies,” Alan Rich, Chrome River CEO, said in a statement. While less than one-quarter of the officers surveyed said their company doesn’t have any policy regarding the use of sharing economy services, 17 percent have instituted policies that don’t allow the use of ride-hailing services, and 24 percent prohibit their employees from booking accommodations through home-sharing platforms. Perhaps even more surprising were the percentages regarding the mandating of such services: 13 percent of companies require their people to use ride-sharing apps, while 12 percent have dictated that travelers must use home-sharing instead of hotels for lodging. The implementation of rules and policies for reimbursement and reporting of expenses related to these services follows the rising trend among leisure travelers. The survey data shows some are still hesitant to utilize such options. Does your company allow you to use sharing economy accommodations or are you limited to just traditional hotel and travel brands? Tell us about your experiences in the comments below, on our Facebook page, or in our Twitter stream. If you’ve booked a room, apartment, or home through Airbnb for leisure travel and you’re considering how you might use the home-sharing platform for business accommodations, you’ll be happy to know that Airbnb has a new search function/program specifically for business travelers. Categorized as Business Travel Ready (BTR), available properties must have a designated workspace or desk, wifi, and 24-hour check-in, although many of them often boast other amenities. The search function also highlights entire homes available for short-term use so that teams can share accommodations or individuals can have the entire space to themselves. In order to access the BTR properties, you must link a work email address to the Airbnb account — so no Gmail, Hotmail, etc. It has to be your work email. You can sign up as a business traveler through airbnb.com/business-travel-ready, and you’re ready to find your next business travel lodging. he has 150,000 properties listed globally, and 250,000 companies are using the site. According to a story on Travelpulse.com, David Holyoke, CEO of Airbnb’s business travel department, expected the number of people using the site for business purposes to quadruple in 2017. While only 10 percent of their bookings are business related, the amount U.S. businesses spent on travel expenses topped $290 billion last year, and was expected to increase by more than four percent last year. In 2016, the company achieved an industry first when it partnered with American Express Global Business Travel (GBT), BCD Travel, and Carlson Wagonlit Travel to add home-sharing accommodations to its traditional corporate travel offerings. Have you used Airbnb for business travel? Would you do so now that they have improved their business offerings? Tell us your thoughts in the comments below, on our Facebook page, orin our Twitter stream. 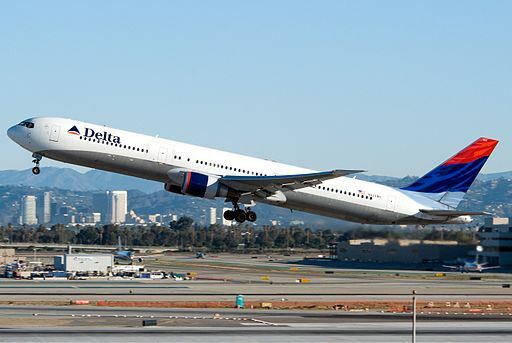 Delta has just added another way its SkyMiles members can accrue points toward reward travel, and you can get them just by sleeping on your next trip. Besides booking flights and making purchases with a Delta credit card, now members can earn points when they choose Airbnb as their lodging. Members must book lodging through deltaairbnb.com, and earn one mile for every dollar they spend. and recently talked about how Airbnb is returning to its roots and working to attract business travelers. The arrangement has benefits for new Airbnb members too who are looking to “Fly Global, Live Local,” with $25 credit earned toward any stay totaling $75 or more if they book via the Delta dedicated site within 60 days of opening a new Airbnb account. In addition to the flat mile per dollar deal, those whose stay totals $75 will earn an extra 500 miles, and those whose stay totals $150 or more will earn 1000 extra miles. Business travelers, wouldn’t it be great if you could break out of the hotel routine, even if it’s just for a couple days? Wouldn’t you enjoy eating in local restaurants and exploring the local scenery? What about saving as much as 20 – 30% over your normal hotel costs? With its new, “Don’t go there. Live there.” campaign, Airbnb is trying to reach business travelers who are tired of hotels, or just want to experience more that a city has to offer. With its push to garner a share of the business travel accommodations marketshare, Airbnb is actually returning to its roots. The company was started in August 2008 in San Francisco as a way to provide conference attendees alternative housing options that were considerably cheaper than the area’s hotels. Since making a concerted effort to market its services to business travelers, business bookings have tripled since July 2015. Airbnb reports that 14,000 companies are signing up weekly, due to the company’s integration with major management systems, such as American Express Global Business Travel and BCD Travel. The company says the savings can be as much as 20 to 30 percent when compared to hotel accommodation costs. You’re traveling to a new city, either on business or leisure, and you want to experience it the way the locals do. Before 2008, the idea of staying in someone’s home was only a viable option if you already knew someone there. Airbnb (and before that, HomeExchange) changed all that. Now you can safely stay in someone’s home or apartment and perhaps even share a meal with your hosts, providing a uniquely personal way to get acquainted with your destination. It may not save you a lot of money, but travelers can stay in Dairsie Castle, Scotland as part of Airbnb. While you may already be familiar with the shared economy of accommodations, did you know there’s also an alternative to the traditional rental car industry? Through companies like RelayRides, Zipcar, Hubber, Getaround, and JustShareIt, individuals can share their vehicles with travelers who need them on demand, or for as brief a time as one hour. In some cases, the owners of the cars pick their renters up at the airport, saving time spent in rental car lines. If you’re looking for a different mode of transportation, Spinlister offers travelers the ability to rent a bicycle, snowboard, or skis. You can even rent a boat using GetMyBoat. Backbid.com works like Priceline, but in reverse: hotels bid by offering lower and lower prices to win your business. And there are ways to take vacations that don’t cost much more than your regular living. For example, if you could drive to a new city 1,000 miles away and stay in an Airbnb apartment, you’re looking at the cost of gas and lodging. You can cook your own food, which you would have to do anyway, and you can just walk around and experience a brand new city for an entire week, and try the inexpensive and discounted activities. Airbnb has not only brought some big changes to hotel travel, it has even introduced travelers to some very exotic and wondrous properties. 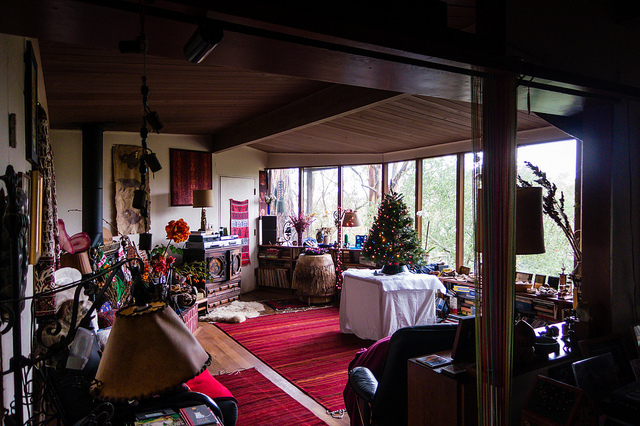 Yahoo Travel recently discussed Airbnb rentals that are truly amazing places to stay. Although Airbnb is considered a budget travel site, it doesn’t always have to be a place to find hole-in-the-wall accommodations. In fact, there are quite a lot of nice places to stay. And some places are amazing and affordable. 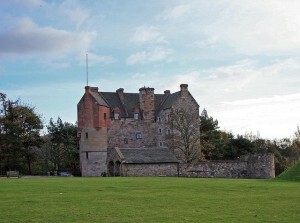 Three particular places the article calls out include a glass tree house in the Tuscan forest, a Scottish castle, and a restored windmill in Santorini. Who wouldn’t want to stay in such a place? And even if you’re not looking to stay in someplace quite so over the top, you can still find really nice spaces right in the heart of expensive cities for quite a bit less than you’d pay for a hotel in the exact same area — and with more amenities, like a kitchen or an actual separate bedroom. We especially liked the boot house in New Zealand and all of us around the office want to stay at some of these places. They look very enticing. Airbnb is something of a wonderland. You could create quite a unique getaway just in the properties, staying only in the places with a lot of charm and unique settings. Or you could even try a tiny house and see if you would actually enjoy joining the tiny home living trend. Since it’s a major lifestyle change for most people, diving in through Airbnb might be a good way to try it out. The options on Airbnb are almost without limit. If you haven’t checked it out yet, try it out on your next trip and tell us what you think. Or if you’ve already stayed in an Airbnb, let us hear from you. Did you like it? Would you recommend it to friends? Or are you happier in a hotel? Leave us a comment below, or on our Facebook page.